I'm back with another Valentine's Card to share. 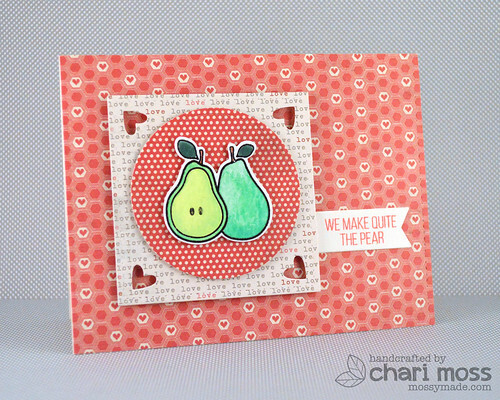 Today's card uses Simon Says Stamp Quite the Pear stamp set and matching dies. I used papers from an older My Mind's Eye paper pad that I only seem to break out once a year. 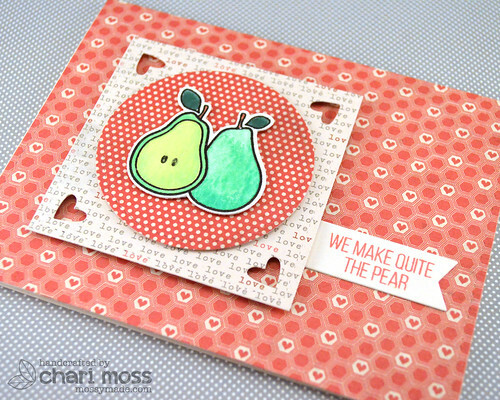 The pears are embossed and watercolored. I used a small heart die to create the cut outs in the corners of my square mat. These little pears are just adorable. :) Thanks for stopping by today. I have more valentines to come so stop back by tomorrow! Lovely Valentines card! So sweet. Those heart cut-outs are perfect! So beautiful, love the little cutout hearts and design tfs.